The blessing of Michael Archangel Pre- and Primary School in Ndanda took place on January by VG Fr. Patrick Mwaya, delegated by Bishop Titus Mdoe. The school was opened the following day, 25 January 2018. The name of the school was St Michael. But as there were so many problems with the Ministry of Education the name had to be changed to Michael Archangel Pre- and Primary School. The school could not be opened in 2017, but only 2018 because the full registration was necessary and that process turned out to be extremely difficult. One bloc is named Rufina, because of a donor from Korea, after a lady who died there in young age by cancer. We thank the Lord for unceasing support and encouragement to continue. We thank our friends of different organizations and thousands of persons of good will who supported us faithfully. Proudly we can say: there are no debts of capital investment. The institutions are selfsufficient concerning running costs. Anna Fund and other donations help needy Aquinas Students with bursaries, St Michael Fund helps needy students in the Primary school with bursaries. So far the foundation is sound and strong to offer an excellent contribution to EDUCATION in Tanzania, Mtwara Region, open to all citizens whatever creed or background as centres of excellence. And the people have seen what was built up and started to entrust their children to the care of the Missionary Benedictine Sisters with high expectations. There is much reason to give praise and thanks to God who has entrusted us with so much seeing our littleness and poverty in any aspect. All what happened is a miracle and the work of God Almighty. May He be praised and see us worthy to continue to entrust us with his children. 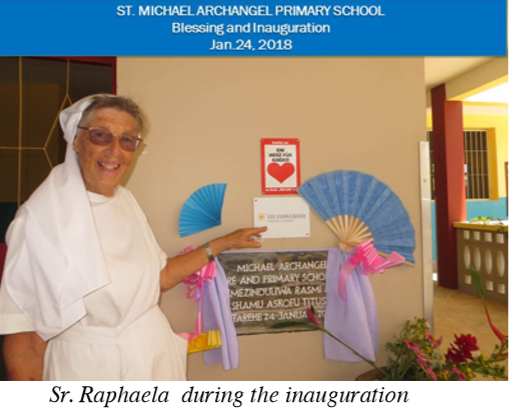 With this background the blessing and opening of Michael Archangel School is a big milestone in the history of Ndanda Priory and the realization of the broad vision. Deo gratias.